June-September rentals are weekly Saturday-Saturday. "Beach Week" Rentals are welcome see note below*. NEWLY RENOVATED! Check out our NEW Photos! New bathroom, Kitchen, Living room flooring, HVAC, Deck. Largest unit in COVII that can legally accommodate 6+ guests. Waterfront 2 BR, Walk to beach, Boat Dock, Plasma TV. Beautiful renovated Waterfront 2 Bedroom, 2 Bath end unit condo on top floor with a wonderful Sunny Southern Exposure & water views. Great for tanning or relaxing. One of the few properties in Ocean City with off street parking for your vehicles and TRAILERS!. New beds in all bedrooms, Weber Gas Grill on Lower deck! New Deck, Kitchen and expanded Family room in 2018.
call or email for a quote or ask questions. Bring your boat or Jet ski. Fish & Crab right from your 12’ wide Boat slip #19 directly in front of the Condo. Located in sought after Club Ocean Villas II, one of North OC’s most desirable communities, 2 Pools (Indoor for those rainy days and Outdoor), Tennis and Racquetball courts. Dedicated parking for your trailer/Boat. Private gated patio (courtyard for grilling) and upper deck with table and chairs - (2nd floor). Bring your bikes and beach supplies - everything can be kept on the private enclosed patio. Easy 2 block walk to beach, across from the Carousel Hotel on 120th Street, walk to CVS, Food Lion, WaWa, Crab Cake Factory, 7-11, the Original Green Turtle and more. Built in CD/Stereo system, in-ceiling speakers, 50" & 32" TVs, DVD, Control4 Home Automation System, DirectTV for the rainy days. Free Wifi in Unit. Call Eric for more info or to arrange a rental. *May & June 'Senior Beach week rentals' for High School Seniors require $700 security deposit and Parental Co-signer. 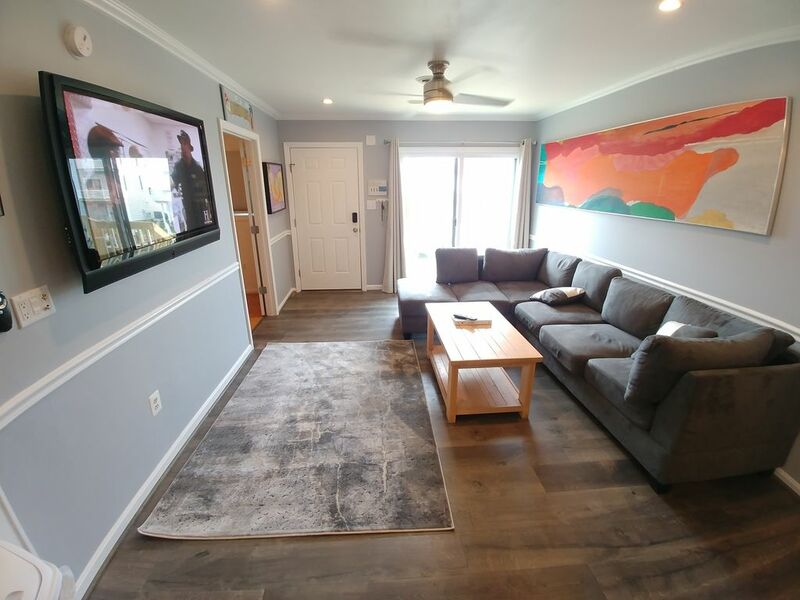 Need more space see our other rental in Ocean City, VROB Listing #219559. OC lover, sharing the love. Great spot close to fun bars, restaurants, Beach, amusements. On the bayside water with great fishing and crabbing off dock or boat. Close walk to the Nations cleanest beaches as rated by National Resource Defense Council 5 out of 5 stars! (http://www.nrdc.org/water/oceans/ttw/md.asp?zoom=13&lat=38.4183&lng=-75.0843&utm_source=referrer&utm_medium=copy&utm_campaign=ttw) Close to food stores, restaurants and Bars. Property has 2 pools one indoor and another outdoor. 5 Minute walk to beach, with close by restaurants, bar and chair/umbrella rental. Bay side Condo with water views and full gorgeous canal view and boat slip directly in front of condo. Water and power hook up available at boat slip. Boat slip available for use in front of condo. Enclosed patio for storage of your beach gear and bikes. The only thing left to update are the double mattresses, they roll to the middle. Everything else was beautifully updated. Great location! Amber, glad you enjoyed your stay. We were unaware of any issues with the mattresses. We had just replaced them a year and half ago. Thanks for letting us know. Property was not only in a great location , but was also very clean and updated . A week in June at OC, MD. As promised, this charming spot provided a relaxing and safe venue for a wonderful family beach vacation. Not only is this a clean, spacious and well- maintained unit on the water, it is quiet and very serene. Loved the view from the deck. Convenient wick jaunt to the beach with safe crosswalks. Highly recommended location for a family or group of friends to enjoy a week at the beach. Such a great time yet again! This is our second year we've been down to this unit and we will continue to come back. It's in a great location, 2 minute walk to the beach and right behind food lion and other gas stations where you can get anything you need. Both an indoor and outdoor pool which was great for those days you don't want to go to the beach. Eric is great to deal with, as he made everything flow so smooth with booking and such. When we got there the grill was out of propane and with a quick phone call to eric he had the issue resolved so fast! We had a group of 6 total and the unit accommodated us very well! Perfect location! Perfect place! Perfect vacation! Thank you eric for another great and memorable year, we will definitely see you again next year!!! Had a great time! Perfect location to everywhere. And being on the water was amazing! We went down in late june for a week. Everything was acurate as described, loved the location so close to wawa and foodlion. Room itself was great too, we had a blast and eric was great with answering our questions. A definite will return great trip great memories before our friends go overseas...thank you eric! So glad you had a wonderful time. The weather was fantastic in June. We look forward to having you back in the future.